It was so long between my last and previous posts that there were quite a few pictures and tales that I didn't share. I thought I'd do a mixed bag of a post now to give a taste of the last few weeks here. ....the incredible Red Arrows were on top form as always. If you fancy flying with them, you can get as close as most of us would want to by watching this video http://www.youtube.com/watch?v=1e-aw3aJpBc ...how on earth they do what they do is beyond me! Heart stopping stuff! ....wow, what a sight. I found it really emotional, especially as our dad and uncle were in the air force and uncle David was killed when he was on a mission. I did take a video of the Lancaster as it was being escorted by two Spitfires....it came over the rooftops and right overhead - unfortunately, I had inadvertently turned the camera off!!!! Darn! ....he really was a whopper, but I welcome all the spiders as they do help to keep the insects at bay. This white Foxglove was a surprise one morning....I had sown seeds for purple flowers and then this one was suddenly there in all its glory. Stunning Sweet Peas and Pansies that both seemed to glow with ultra violet shades. of spider's webs festooned amongst the drying Poppy heads. Sorry about the big gaps everywhere - I had a nice quartet of photos planned to sit in a neat square....blogger had other ideas of course! Back in mid August I also made good use of one of the thimble houses that Heather gave to me. They were one of those purchases that she meant to do something with and then never did, so she thought I might better use of them. I ripped a couple of the wooden strips out to give me different sized spaces to fill and then, after a quick sanding, I gave the whole thing a few coats of paint - you can see the dodgy pattern on the roof showing through! I left the inside back mostly unpainted as I planned to use papers inside anyway. That was also the day after I had decided to give the Doo Lally room a real blitz! I decided to stack all my Distress ink pads in a long box that's been sitting in the cupboard for ages and I have them in piles sorted by colour families...makes things much simpler. I've got my extra fine colouring pens on top as well as my Neo colours. I admit that the tidiness didn't last too long, but it's better than it was at least. Anyway, here's the finished thimble house, decorated and filled with a mix of my Christmas stamps, dies and other little bits and pieces. I used Gesso sprinkled with Rock Candy glitter for the snow. The little deer on the right is from my Winter Silhouette set, stamped onto shrink plastic and given a bit of sparkle with a glitter pen. Although today turned into a gloriously warm one, there's no doubt that there's been a little nip in the air this last week or two and my neighbour/cat sitter (!) and I were contemplating the colder months drawing nearer - mainly prompted by the huge number of berries that are already heavy on the bushes which she thinks are a sure sign of a harsh winter. We were swapping tips for keeping warm and listing the things that we need to sort out like replacing old hot water bottles, getting the cardigans out of "storage" and stocking up on fluffy socks and spicy scented candles....the latter being for psychological warmth! But there's still some warm days left I think, so meals like this one have been quick, easy and cheap....almost free in fact! Yummy, scrummy home grown courgettes, french beans and tomatoes roasted with a splash of olive oil and served on toasty bread. I found another massive courgette/marrow hiding under a leaf but, after my last disaster with one of those giants I decided to pass it onto my neighbour instead - think she did a better job of cooking it than I did! A couple of weeks ago I was down in Coventry where I was teaching a workshop for a brilliant group of ladies who really got stuck in and we all had a great time getting inky and messy! I can't find any pictures of what the ladies made...I'm sure they are on my files somewhere! Here are a couple of things that I've made using my new Christmas stamps though...just a random selection! This was an empty coffee jar that I covered with paper - out of which I'd cut an aperture that I backed with vellum, stamped with an image from the "Be Still for the Glory" set, coloured with Pro Markers.I also punched small holes in the paper and I added a collar of card that I ran through a Tim Holtz rosette strip die to disguise the screw top of the jar before tying a ribbon round it. The vellum shows the candle through really well. It's sitting on the mantlepiece beside the picture of my lovely David. I had a lot of fun making this card. The character is one of my Steaming Snowmen and I've added him to a background that features white acrylic paint and Goosebumps spray (more on this at a later date) which I've added Distress inks and Stains to. The lamp post was cut from Grungeboard - I used Rock Candy crackle paint and Stains to get the surface textures. It's a fun card with the snowmen flying by! Last Saturday was a completely different one as I was taking part in a puppet show for the Big Church Family Picnic. It was going to be held in the Vicarage garden, but the weather was rather unpredictable so we headed into the church hall instead. I had three roles...Camille the camel, a stripey knitted character singing "Praise and Shout" words to the tune of the Beatles Twist and Shout (with backing group!) 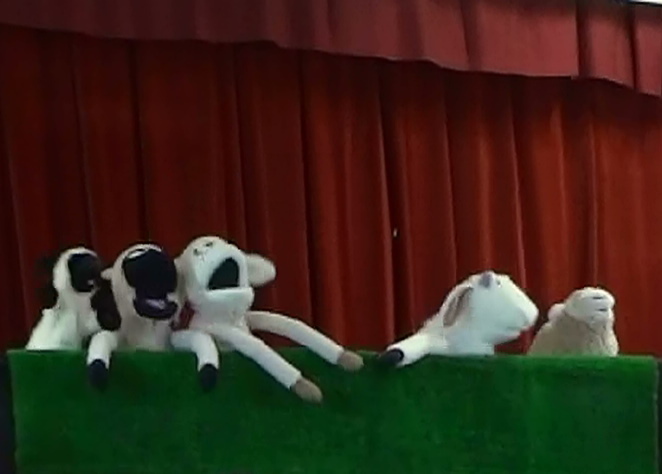 and two sheep amongst a singing flock - think the Beach Boys Barbara Ann with slightly different words - very funny! I was the two sheep on the left - my arms were a bit sore, but I really enjoyed the afternoon, as did all the children...and adults too! Well, what a lot of photos! Room for two more though I think, just for everyone who likes to know how my two terrors are getting on. Tara has been mooning around all week as she knew there was a freshly cooked chicken in the fridge and she just can't settle till she knows that every scrap has been eaten - preferably by herself! Thomas is his usual steady self, guarding his mum every night and patrolling the garden between naps. Love those enormous feet! As for madam, well, this picture says it all - "just you try it mate..."! Well, I'd better sign off now before I use up my whole blog capacity of photos! I was going to watch Whitechapel but I've decided it looked far too creepy, so it's been switched off! 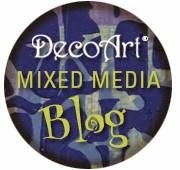 If you haven't left a comment after my previous post then don't forget to add one now (it must be after the previous post) to be in with a chance to win the Tim Holtz blog candy. You have until September 17th to enter. Okay, I'm off, saying goodnight and signing out till next time. Boy you have been busy !! Love the thimble house and Tara, well that face says it all ! !